The Chronicles of Amoronia: Belle De Couture Interviews Amoronia and Hosts New Giveaway! Belle De Couture Interviews Amoronia and Hosts New Giveaway! I am very excited today, because Jen from Belle De Couture, a lovely fashion blog, wanted to do a Q&A with me, and maybe host a giveaway. I said yes, absolutely, because I love to give things for free, plus I am celebrating two years on Etsy! Officially, I opened on March 22, but I was registered as a simple user around this time! If you want to take part in this giveaway, please visit Belle De Couture, read the post there, and leave comments! You could be the lucky winner! 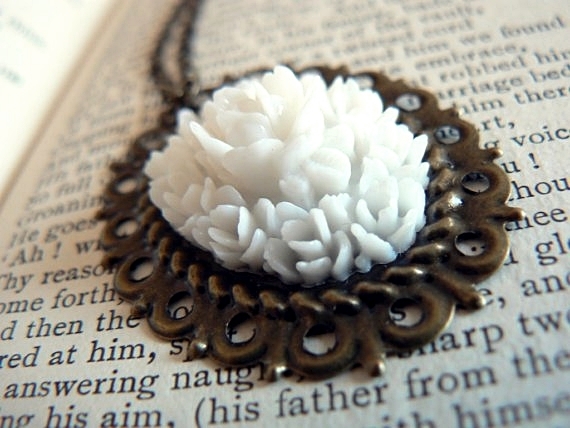 I will be giving this away: White Roses Occasion Necklace, in Antique Brass. Hurry! The giveaway ends on Friday 17! gongrats!!! you deserve it, your jewelry is so beautiful!